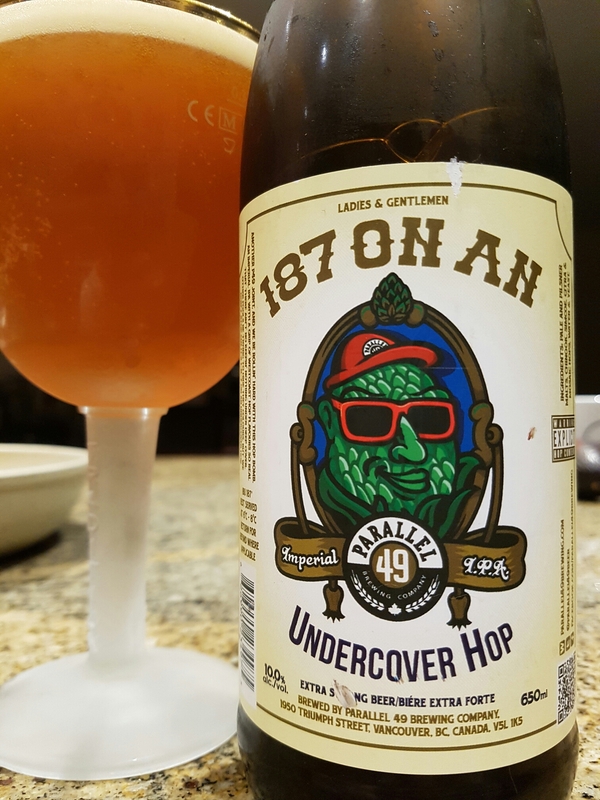 187 on an Undercover Hop – Parallel 49 Brewing Co. (Vancouver, BC, Canada) | Justintoxicated. Ingredients: pale and pilsner malts, chinook, simcoe, citra & mosaic hops, water & yeast. Visual: Pours clear luminescent orange without a significant lasting head, light sticky lacing, thick ringed retention with a large island, suspended sediment, singular micro streams. Finish: light nutty, bitter resiny hops. Summary: Lots of weight and body in this one, the heavy alcohol is quite apparent and compounds with every sip. Good quality of brew.